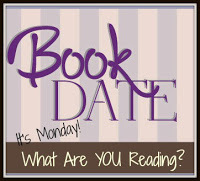 Book By Book: It's Monday 5/7! What Are You Reading? I'm back from Booktopia 2018! Wow, what an amazing weekend (again). This annual event held at the wonderful Northshire Bookstore in lovely Manchester, Vermont, and is an entire weekend devoted to books, where readers and authors talk about books, get to know each other, and even enjoy meals and games together! It's completely unique, as the authors comment every year, and a lot of fun. I will recap the weekend, the authors, and the books later this week (after I catch up a bit). As much as I love Booktopia, it is also exhausting! My mom and I always go together (this was our third), and she said she was exhausted, too, so with my chronic illness, I am really wiped out today. In addition to the weekend, I spent all day Thursday driving up there and all day Sunday driving home - luckily, my mom's house is about in the middle of the trip, so I could stop to eat and nap. I am in my recliner now - yawning and counting the minutes until my massage therapy appointment because my back is killing me! Last week, I quickly finished a Booktopia book, All the Beautiful Lies by Peter Swanson. I chose this mystery/suspense novel next because I was in the mood for something fast-paced - and this really fit the bill! It's the story of a recent college graduate who returns to his hometown in Maine when his father dies only to find his much-younger stepmother coming onto him and a mysterious young woman wandering around town who seems to be involved somehow. The lies and secrets pile up in this suspenseful novel. I enjoyed it, and the author was very entertaining this weekend! Next, I started (and am still reading) another Booktopia selection, My Life with Bob: Flawed Heroine Keeps Book of Books, Plot Ensues by Pamela Paul, the editor of the New York Times Book Review and host of its weekly book podcast. I'm enjoying this memoir told through books and can relate to some of her experiences. It's been weird reading her memoir - and then seeing her this weekend - because I hear her voice in my ear every week when I listen to the podcast! On audio, I finished the middle-grade novel, Posted by John David Anderson, about a middle school that bans cell phones. A boy nicknamed Frost and his three misfit friends start a trend of using sticky notes to communicate, and a new girl named Rose changes things for all of them. I enjoyed it very much, with its warm, funny, and poignant story about finding your tribe. Next, on my road trip this weekend, I started listening to The Great Alone by Kristin Hannah (it seemed that this big trip called for a big book! ), a novel I have heard rave reviews of. It's excellent so far, and easily kept my attention on that long last stretch last night! It's set in 1974, about a family that moves to Alaska. The husband/father was a POW in Vietnam and is clearly suffering from PTSD (though that diagnosis didn't exist back then) and moves the family to a remote cabin in Alaska impulsively. Things go well at first (it's summer! ), but now winter is starting, and his mental condition is deteriorating rapidly. It's compelling so far, and I love the 13-year old girl who is the main character. My husband, Ken, finished Fifty Mice by Daniel Pyne, a thriller with an intriguing plot: a man has been put into Witness Protection and moved to a community on Catalina Island in CA, but he doesn't remember what dangerous information he knows. I need to ask him what he thought of it. Now, Ken is reading The Troop by Nick Cutter, a thriller I gave to my dad as a gift that was among the many books we inherited from him when he died three years ago. Ken and I both love reading his old books because he shared our love of reading. I have heard this one is a bit gruesome, but my dad loved it! I'm guessing that our son, Jamie, 23, is still reading the Wheel of Time series by Robert Jordan. He is on book 7, A Crown of Swords. Graduation is just three weeks away, so he is super busy with both school and job hunting. Fiction Review & Author Interview: The Optimistic Decade by Heather Abel - I interviewed this Booktopia author, and my mom and I both loved her novel! My mom and I at Booktopia this weekend! How terrific that you are able to go to Booktopia! It always sounds like a wonderful event. Yes, that's it exactly, Shaye! You should try it next year! Look at you and your mom, there's definitely a family resemblance! I have the Great Alone on my shelf and hope to get to it this summer and Posted sounds like fun (especially as a tech fiend). I am just starting the Newbery Award Winner, Hello, Universe. The Great Alone is intense but good so far. I have The Great Alone on my wish list! It's very good so far - intense & compelling. This was my first of his! I definitely want to read more. The Great Alone is on my TBR pile. I have added the book about books. I admit that I love books aobut books! Thanks for visiting my blog and giving me an encouraging word about my endless cold/cough/allergies. I seem to have emerged through the other end but the cough lingers. But at least I feel better and have some energy. My dad is in a care center finally and is getting PT and Speech Therapy. I had a daughter/father talk with him today reminding him to get up and move or he may never be able to do it again. I am reading a very, very good YA novel right now, The Astonishing Color of After. Me, too, Anne - any book about books is on my list! Loved Will Schwalbe's book last year. Glad your dad is making some progress. If only Booktopia wasn't so far away. It sounds like a fabulous event and even cooler that you get to go with your mother! It is fabulous! And, yes, wonderful to get to enjoy it with my mom. Oh Booktopia sounds amazing and to be in Vermont as well. I bet the driving wiped you out, it can be very tiring. I just cleaned the outside of my car today which had mud splattered on it from roadworks along my trip. Great that The Great Alone is working out for you on audio, I enjoyed reading it and one of my sisters is listening to the audio. Yes, it was a wonderful weekend, Kathryn! The Great Alone is getting intense now. I am extremely jealous of the Booktopia event. Wish we had events like these in Sydney, Australia. I’m glad you had fun at Booktopia. I love the photo. I have The Great Alone on my TBR list, so hopefully we both like it. Have a great week! It's good so far - very intense & compelling. Listening to the Essex Serpent, trying to, at least. Not too easy to listen to as you have to pay attention - so much detail. Sorry to hear that - some books are tough on audio. Hope it gets better! Looking forward to reading "My Life with Bob" but was really bitten by another reading memoir - one written by Susan Hill ("Howard's End Is on the Landing") where the books that she mentioned consist mainly of White authors, so I am a little jaded. Oh, sorry to hear that, Myra. I've enjoyed My Life with Bob, though my favorite book about books is still Will Schwalbe's Books for Living.